Summary : An exceptionally light, yet subtly sweet, white tea from the Dragonwater Tea Company (now out of business). This tea is a rather unique, and tasty, mix of green and white tea. Review : Call me a snob...but I've come to like white teas, which are considered the "premium of teas" due to the high quality leaves used and their relative scarcity. I really enjoy the light, subtle and frequently "light-sweet" flavors found in various white teas. I find white teas just slide right down, produce little in the way of strong after-tastes, and, in general, are just plain enjoyable to drink when you are in the right frame of mind. So...because I'm a "tea snob," I always look forward to sampling new white teas. And, while watching the Cowboys lose to the Saints on Sunday Night Football, I decided to give this sampler I purchased from the Dragonwater Tea Company (now out of business) a try. Here is how Dragonwater describes this tea on their website : "White Monkey Paw Tea. Rare, handmade Chinese tea from the Wuyi Mountains that, according to legend, resembles a monkey's paw. Only the top two leaves and bud are picked during the morning of the first two weeks of the spring harvest season. The leaves are hand processed with only a gentle steaming. This tea is considered both a white and green tea. Has a velvety smooth flavor with a wonderful aroma. Produces a light, slightly sweet cup." Right out of the package the tea is packaged in, I suspected I would like this tea. The leaves are huge...and very high quality. The aroma, while far from strong, says "I'm a White Tea" in a rather pronounced way. And the taste...well...it tasted like a unflavored white tea, what did you expect? Actually, though, in some ways this tea tasted like a light green tea, too...probably why this particular tea is considered both a white tea as well as a green tea. The flavor of this tea is indeed very, very smooth. And if you are looking for bitterness in this tea...well...keep looking, as you won't find it here (unless you way overbrew it). All and all, I found I really enjoyed this "straight white tea." While it isn't my favorite white tea, this is probably due to the simple and undeniable fact that I like "sweet things." But there is no argument from me that this tea has a enjoyable flavor, high quality leaves and is just plain soothing to drink. Recommendation : Yes. 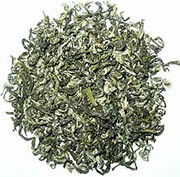 This is an excellent white tea, especially for those who want "nothing added" to the leaves. This tea also nicely combines the best tastes of both green teas and white teas into a pleasing mixture. Brewing Instructions : Use 1heaping teaspoon of leaves. Pour water heated to 180 degrees over leaves. Let brew for 2-3 minutes.